Conditions at three mobile home parks have pushed the properties to the top of the seemingly endless list of blighted structures Ypsilanti Township’s Office of Community Standards is addressing. A judge recently ordered 14 abandoned mobile homes removed from one park while township staff brought two more parks with similarly bleak and dangerous conditions to the attention of the Township Board of Trustees at the Feb. 13 meeting. 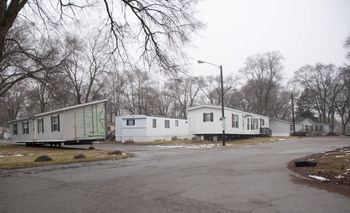 Wasthenaw County Circuit Judge Archie Brown ordered Greenbriar Mobile Home Park owner Gerald Burton to remove the abandoned trailers from the park, located at 2500 Holmes Road between Holmes and East Michigan Avenue, by Feb. 25. Many of the mobile homes there have been stripped of scrap metal and are providing shelter for vagrants. Doors and windows are broken on units throughout the park, and some face issues ranging from collapsing porches to leaking roofs. Township attorney Doug Winters also reported to the Board of Trustees that township staff will be addressing similar, if not worse, conditions at two nearby mobile home parks. The properties are both owned by WOC Realty LLC and are in tax foreclosure. One is at 2590 E. Michigan Ave. and the other is at 117 S. Harris Road, just south of the Ford Boulevard bridge over East Michigan Avenue. No paperwork has been filed with the courts yet, but the township is drafting notice of violations outlining the issues at the two parks which will eventually be served to the owner. In an affadavit, Building Director Ron Fulton noted that some of the mobile homes were structurally unsafe and unfit for occupancy. Officials are having trouble determining which mobile homes there are in inhabited and which aren’t because many are in such a degree of disrepair. As with Greenbriar, some units are being stripped of scrap metal. 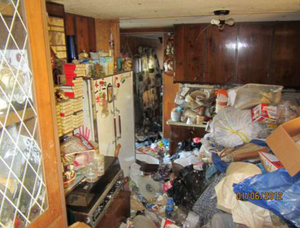 One unit in particular on the Michigan Avenue property is packed with garbage from floor to ceiling throughout much of the trailer, and garbage was spilling out the front door when building inspectors were at the property. On Feb. 15, officials received a report that the drinking water at the Michigan Avenue park was contaminated, though officials hadn't yet determined what it was contaminated with. 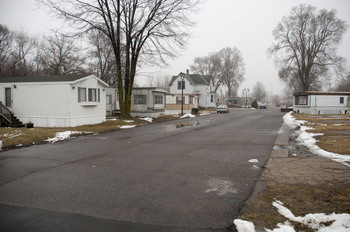 The township faced similar challenges in the now-razed Ypsilanti Mobile Village, which is also in the same area along the East Michigan Avenue corridor. A trashed mobile home at 2590 E. Michigan. The Michigan Department of Energy, Labor and Economic Growth is supposed to oversee licensing of the parks, and Winters expressed frustration with the state for being lax on oversight. Burton, Greenbriar’s owner, did have his license to operate two other parks stripped by the state. He was also exposed by Fox 2 for failing to make water payments at a building he owned in Detroit. The water was to be shut off because he owed $159,000, and he was suspected of trying to rig the water meter. Still, he continues to operate Greenbriar. “What you have here is an absolute failure on the part of the State of Michigan to regulate these mobile home parks. It has been a total abdication at the state level, and it has fallen upon the township to ensure that these mobile home units are habitable, and they’re not,” Winters said. The township must ensure residents are safe, and officials aren't specifically targeting mobile home parks, Winters said. “You can’t sit there and ignore these conditions and say ‘You gotta live somewhere.’ There can’t be a deplorable situation that threatens the health, safety and welfare of people who are exposed to what’s going on at these mobile home parks,” he said. Wed, Feb 22, 2012 : 1:38 a.m.
EyeHeartA2 It is the State's job because State law says they license mobile homes and mobile homes parks and takes that responsibility form local communities. The Manufactured housing association is politically connected and they got the state legislature to step in and and create state-wide regulations for fear that local zoning would work to ban mobile home sites. Tue, Feb 21, 2012 : 3:31 p.m.
What I have noticed in the last 2 weeks is a real clean up on E Michigan. Near the WR hi school and beyond. The amount of clean up has happened so fast that I can't remember what was there. So glad to hear that the mobile home parks are getting a good clean up and out. Very blighted. What is the status of the one on Grove Road near Rawsonville? I saw that area and it is huge. What a mess that is going to be to clean up and out. Wed, Feb 22, 2012 : 2:25 p.m. I am pretty sure that the Liberty Square complex at Grove/Rawsonville is in the appeal process. I think a trial court ordered the buildings demo'ed, but the property owners then appealed that order. So we get to look at the blight for another X months. Tue, Feb 21, 2012 : 1:34 p.m.
Keep up the good work, Ypsi Township! To me, the best money our Township spends is on blight ordinance enforcement. Robust enforcement will slow or prevent the decline in value of the 99% of the property that is not blighted, and also sends a message to property owners that it will be cheaper and easier to maintain property than deal with Township enforcement procedures. Tue, Feb 21, 2012 : 1:32 p.m.